brick & mortar produces single vineyard Pinot Noir and Chardonnay from high elevation sites in Napa Valley, Sonoma Coast and Mendocino Ridge AVA. They produce Old world style, balanced wines that are bright and structured with low/moderate alcohol and distinct site characteristics. Owners Matt, Alexis and Troy Iaconis also specialize in a highly-acclaimed rosé as well as two unique blends of Pinot Noir and Chardonnay, both picked the same day from the same two vineyards, comprised of the exact same blend percentage between Pinot Noir and Chardonnay – one as a white wine (Vin Clair) and one as a red wine (Vin Rubis). brick & mortar’s first single vineyard sparkling wine is set to be released in 2019. The name brick & mortar was founded on the fact the 2011 Pinot Noir would be the foundational wine of the winery. Given that Matt had spent the summer of 2011 in Burgundy, he fell in love with Pinot Noir and the cobblestone towns. When exploring names for the winery, he mentioned that when one goes through difficult times, a strong foundation is needed – and considering the foundation of some of the world’s longest standing buildings is made from many different variations of brick & mortar, the name was a perfect fit. 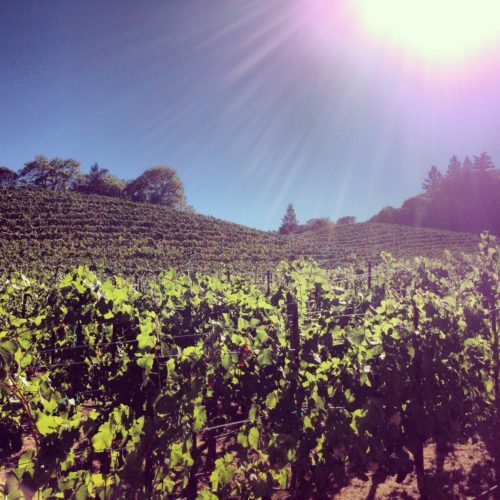 The sun shines on brick & mortar’s La Perla Vineyard in the Spring Mountain District AVA.